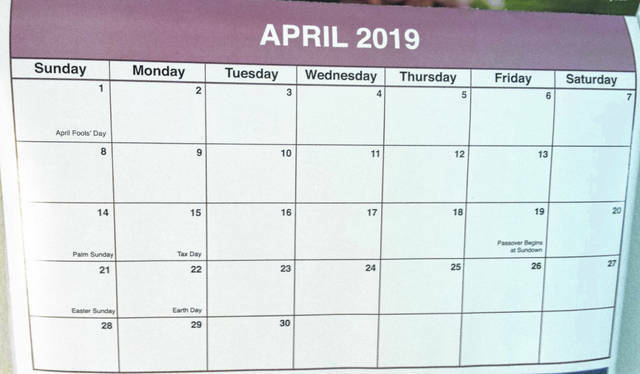 If you’ve flipped your annual News Journal 2019 calendar to the month of April, you may have noticed something amiss. Or perhaps you’ve tried to make an appointment and thought the person on the other end of the phone was crazy, or at least mistaken, about April’s dates. Quite simply, the dates/days for April 1 through April 13 are amiss. They are then correct beginning with Sunday, April 14 through the rest of the year. The dates are also correct for the full-year calendar on the back. It’s due to a production error. So we hope you’ll keep your calendar up for those first two weeks of the month, at least to enjoy the locally shot photos, as well as for the ad for the fine folks at Imagine That Tool Rental and Party Supply, who sponsor that page.